Six-time Tony Award® winner Audra McDonald makes her West End debut as legendary jazz icon, Billie Holiday. Spend an intimate evening filled with some of the most inspiring and moving songs ever written and hear the personal stories of Holiday’s loves and losses through a turbulent but extraordinary life. With a glorious score featuring God Bless the Child, What a Little Moonlight Can Do, Strange Fruit, Crazy He Calls Me and Taint Nobody's Biz-ness you'd better pull up a chair and order a drink because this legend's got a life to sing. 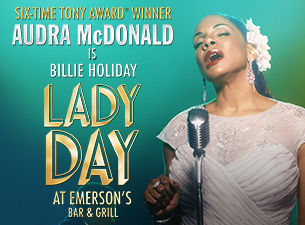 Audra McDonald, a Tony, Grammy, and Emmy Award-winner, is one of Broadway’s biggest stars and holds the record for Tony-winning performances including her Best Actress winning performance for LADY DAY AT EMERSON'S BAR & GRILL.